Having to stay indoors because of the snow, I decided to make more Christmas goodies today. Diamond cuts are a tradition back home and my mom would make kilos of these to distribute to our neighbors. Since I had taken out some oil to fry the diamond cuts, I decided to use the remaining oil to make ribbon pakoda. I had to call my aunt back home to get the recipe as I've never made these before. Both the treats came out well and I've already started distributing these to my friends. I will be baking my special black forest cake on Sunday and will try to post the recipe as soon as possible. Add the flour, salt and enough water to make a soft dough. Make small balls and roll out each ball into thin circles. Cut diamond shape by diagonally making lines with a sharp knife. 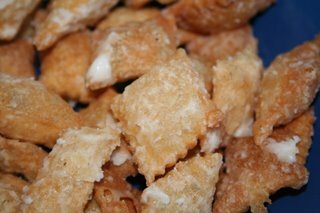 Deep fry the cut diamonds till they turn golden brown and crunchy. Remove from heat and immediately sprinkle powdered sugar on top while they are still hot. Let it cool and store in an air tight container. They will stay good for about 2 weeks. They are easy to make if you have an additional hand to sprinkle the powdered sugar, on top of the hot diamond cuts removed from the oil. This is an important step as the coating of oil sticking onto the diamond cuts will absorb the sugar and help in providing an even coating of sugar. Heat oil in a pan. In a mixing bowl sieve together gram flour, rice flour, baking soda and salt. Add 2 tsp hot oil and enough water and mix to form a soft dough. 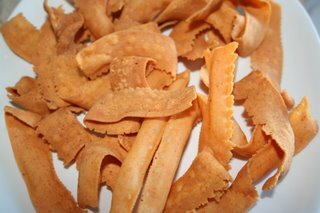 Fill either a cookie press or muruku press fitted with the flat thin ribbon pakoda disc, with enough dough and squeeze on top of the hot oil. Fry till they turn golden brown. Remove from heat, let cool and then store in air tight container. Because of the gram flour the dough becomes hard easily, so you need to mix a little water every time you are refilling the cookie press or the muruku maker. Amazing to see this traditional South Indian snack recipe. do keep sharing the same. Looking forward to more of authentic SI delicacies. Keep them coming.